Meeting the need to control odor while maintaining access to a pre-aeration basin, the Grand Strand Water and Sewer Authority of South Carolina needed a cover for its pre-aeration basins. Because of the plant's proximity to homes and a golf course, odor control was a primary concern. Meeting the need to control odor while maintaining access to a pre-aeration basin, the Grand Strand Water and Sewer Authority of South Carolina needed a cover for its pre-aeration basins. Because of the plant's proximity to homes and a golf course, odor control was a primary concern. 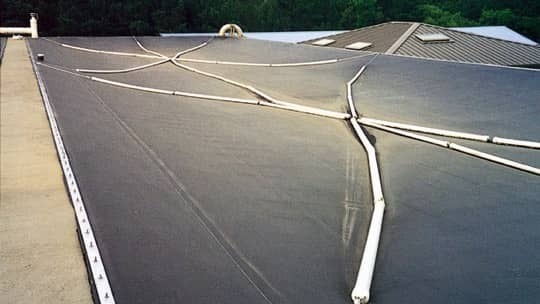 Geomembrane Technologies Incorporated (GTI) was chosen to develop a unique floating cover system that not only accommodated the surface activity caused by the aeration process, but also provided access to internal equipment and piping. To accomplish this challenge, GTI chose XR-3® geomembrane designed by Seaman Corporation as its floating cover for each of the 136 ft x 41 ft basins. XR-3 was chosen because of its unique properties of strength, low thermal expansion/contraction, ease of installation and resistance to sunlight. These properties were necessary to ensure a long life and provide the flexibility needed to accommodate surface activity. The entire project was completed while the tanks were full; no disruption to the treatment system was necessary. One year later, the XR-3 floating covers are still providing an odor-free environment for the homeowners of Conway and Myrtle Beach, South Carolina . . . just what you would expect from XR-3.